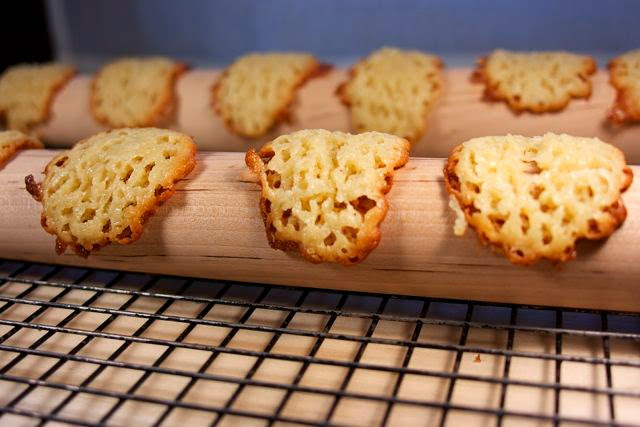 Tuiles is the French word for tile, and these cookies are shaped to look like the curved rooftop tiles that span the Mediterranean's country and sea side. Clay tiles can be seen for miles because of the lack of tall buildings. Sitting in a hilltop cafe you can gaze for hours over the terra-cotta horizon and be transported to the 1800's when some of these villas were built. 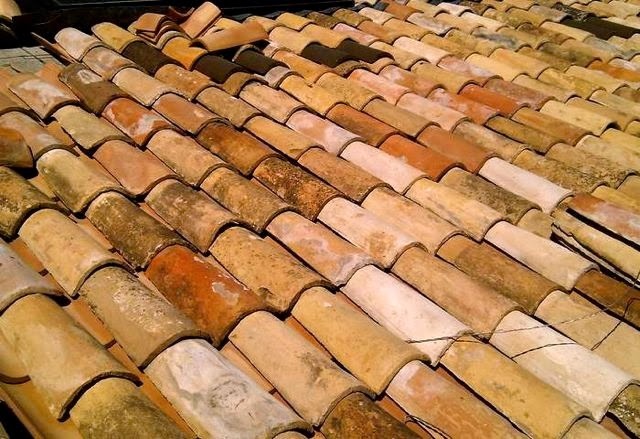 Similar tiles in Italy. 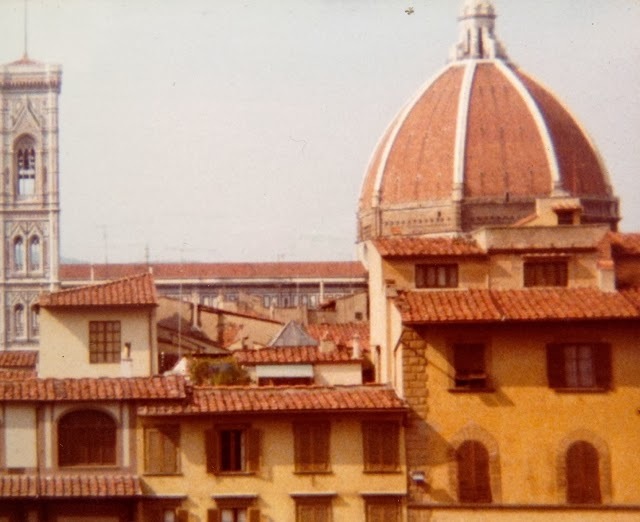 I took this in Florence. These cookies transported me not just to found memories of the French seaside, but to fine restaurants that I have dined in over the years. In fancy restaurants desserts are often flourish with a tuile cookie. I never knew what they were called, but I have eaten them many times and marveled at their fragile beauty. I felt a desire to serve this cookie how I often remember eating it, accompanied by ice cream. 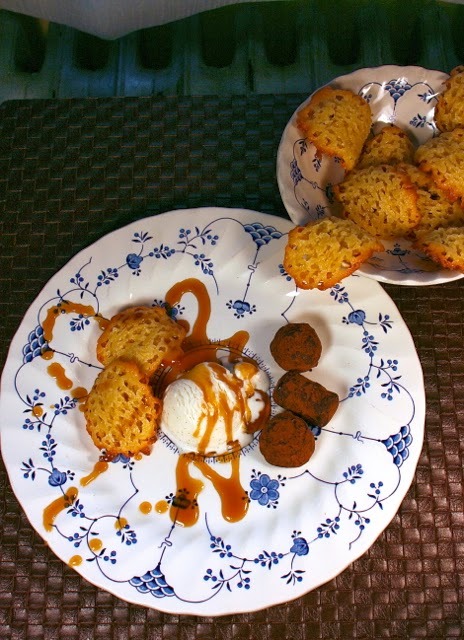 I made a special dessert for my family of Vanilla Bean Ice Cream with Maple Carmel Sauce, an Almond-Orange Tuile Cookie and some Truffles. After eating this we felt like we had just dined in an elegant French restaurant without having left our house. Now the shape of this cookies might look intimidating but they were only a little tricky to make. Dorie's recipe called for crushed almonds, but I used almond flour. It is mixed with regular flour and orange juice to give it a hint of orange flavor that still allows for the almond taste to come through. I refrigerated the dough over night, and put it back in the fridge between batches to keep this very wet dough pliable. I also baked them at 350 degrees, hotter than the recipe called for, turning them at 5 minutes and baking them for a total of 10 minutes. 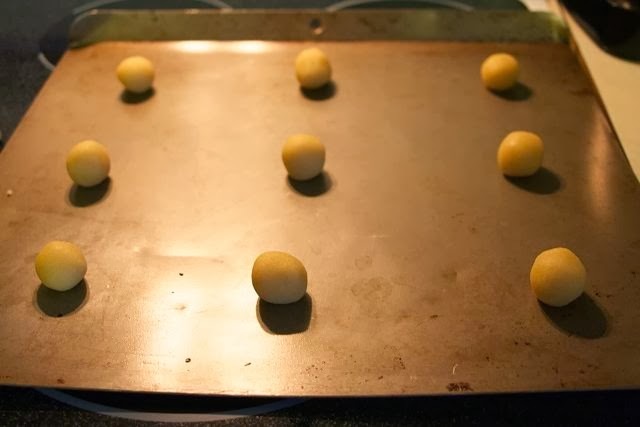 First you shape the dough into little balls giving them lots of space to spread. This is what they look liked cooked. You can leave them flat. Once they stop bubbling you scrap them off of the cookie sheet with a metal spatula and lay them on a rolling pin or wine bottle to cool into the tile shape. 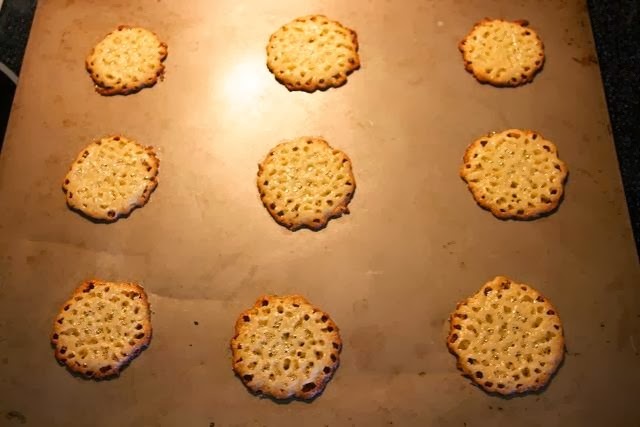 It is a little bit of work to make these cookies, but after a batch or two you really start to get a sense of how and when to move them to the rolling pin for shaping. The result is a truly gorgeous looking cookie that can add pizzazz to any dessert you are serving.. plus they really, really taste good. There is a bit of a crunch when you first bit into them; then the cookie becomes chewy as your mouth melts into the buttery almond orange flavor… scrumptious. 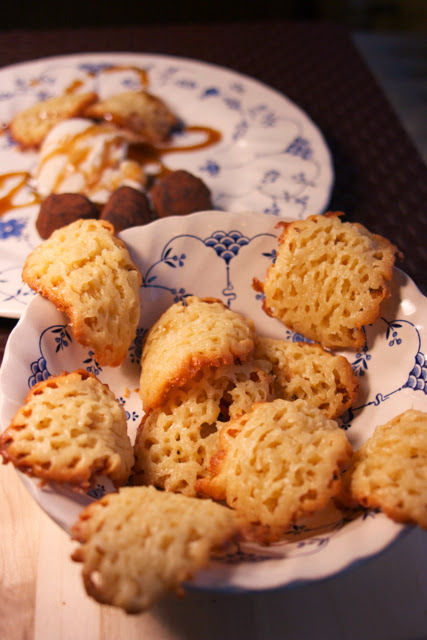 Dorie's recipe is only available in her book: Around My French Table which you must put on your holiday gift list. Click below for a recipe, but if you want the real deal…seriously get this cookbook. You are invited to join my new linky party. 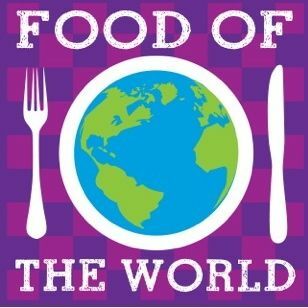 Cook a recipe of your choice from the chosen country and explore the world with us. Dec 10th we will be sharing dishes from Germany. Using almond flour instead of almonds sounds like a good idea. Your tuiles look so pretty ! I have a feeling that the almond flour was easier to work with. I was hoping you would check these out Winnie. They are really cool looking and the texture and taste is amazing. Thanks Adelina,,, there is hope for me as a baker. I found that right when they stop bubbling was the best time to take them off of the cookie sheet. Wish I would have used almond flour too! It looks like it makes the cookie easier to work with. Enjoyed your post and love those lovely cookies! Oh thank you.. I think the almond flour made it easier. Nice post Diane and congratulations on your tuile success! I was excited I am usually not much of a baker. Thanks... I must be learning how to bake from watching my daughter so much. LOVE this post, Diane. 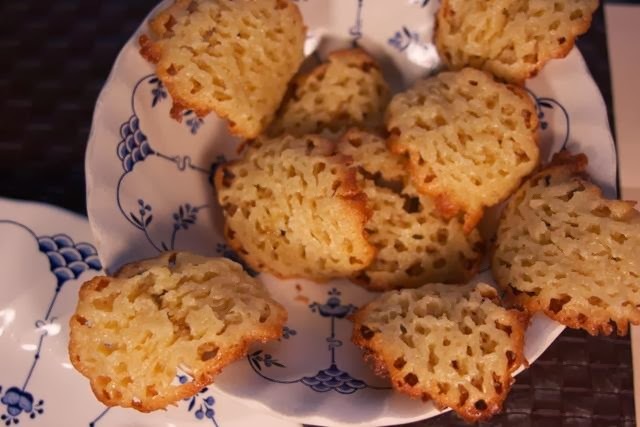 I ill never look at those French rooftops again without thinking of these cookies. Yours look great! I agree. I will now salivate when I look at tiles. I'm glad you had success, Diane! I just couldn't get most of them off the pan in one piece. Sigh. I like your entire dessert lineup. The sauce sounds particularly good. So sorry to hear it didn't work for you. Try the almond flour… I know you have some left over. Yes, the sauce really came out good. If you click on the words I have the recipe posted. I had a terrible time removing my first two sheets of cookies…they just would not come off the sheet pan. Then after researching them I decided to use parchment paper. What a difference! Yours look so pretty and delicate…lovely! Very nice post, Diane! It wasn't that hard to get mine off of the sheet, but using flour made them rise more and made them less sticky, thought I guess it depends what kind of effect you want. Mine were more cookie like instead of the more glass like crisp that I see in the ones made with ground almonds. You make it look easier than it actually is - you're magic. Mine didn't get as crisp around the edges as yours did. Maybe that's why they were harded to remove from the cookie sheet. I did turn up the oven 15 degrees but will go with your 25 degrees next time and use Kathy's suggestion of parchment paper. Your ice cream fantasy dessert complete with truffles almost made me want to go through this whole scene again. Very nice, Diane. Yes, crisp edges would probably help and parchment paper. Well, when we do get together (I know it will eventually happen) I will make you this dessert. Your tuiles look great! I liked the taste of these, but making them - not so much. I liked the taste too much... my husband and I finished the cookies by the end of the day. Congrats on the baking success. And thanks for that pic of the roof tiles -- now I can say "twee" with rooted confidence! I know this cookie was a pain but the tile thing is cool. Yours are gorgeous. What a fabulous presentation! Thank you so much... I just mimicked what I had in a restaurant. I am having a late afternoon tea and these little cookies would just be perfect for me. A perfect afternoon to have cookies and tea. Thanks so much for sharing with Full Plate Thursday and enjoy your weekend! The taste is amazing. I hope you get a chance to try them. These are so pretty and delicate. And they look delicious. Thank you for linking to the In and Out of the Kitchen Link Party. Hope to see you next week. Interesting that you used almond flour and your cookies are perfect. I also used almond flour and thought that might be to blame for my failed cookies. I might have to try these again. Your family is lucky, what an elegant dessert! Thank you, the almond flour seem to make them more cookie like than brittle like, and easier to work with... I think it just depends on what effect you want. These are gorgeous, Diane! I finally caught up on them and well, it wasn't a success. So funny you posted on this... I was thinking about making these for a get together this weekend. Glad yours came out well too.